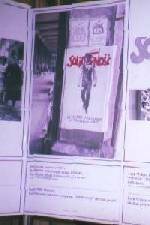 Now, you, too, can have a piece of history in your lifetime - your own Solidarity (SOLIDARNOSC) poster. 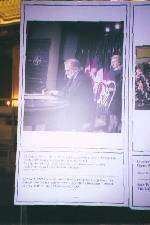 The same poster that helped the Polish people win their freedom - the poster that served as a visual rallying symbol for defeating Communism. 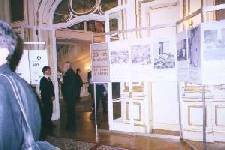 Tomasz Sarnecki (b. 1966), a young Polish graphic designer, transformed a publicity still of Gary Cooper striding down the street in the famous film High Noon (1952) into a campaign poster for the crucial 1989 Polish elections. 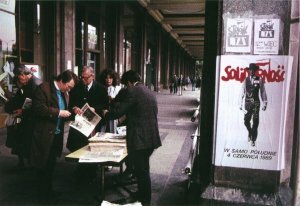 The poster was displayed all over Poland, encouraging voters to end Communist control of Poland. 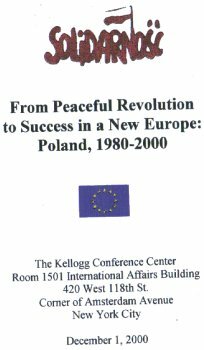 The 1989 elections - the first democratic election in Eastern Europe since 1946 - finally brought to power Lech Walesa and the once outlawed Solidarity Party. 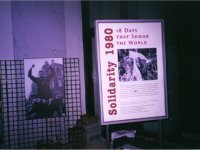 (In 1980, after a rash of nationwide strikes, Solidarity gained recognition as the first legal independent trade union in a Soviet controlled country.) 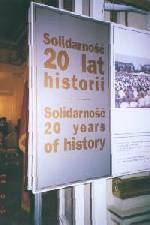 The year 2000 marked the 20th Anniversary of Solidarity -- 1980-2000. 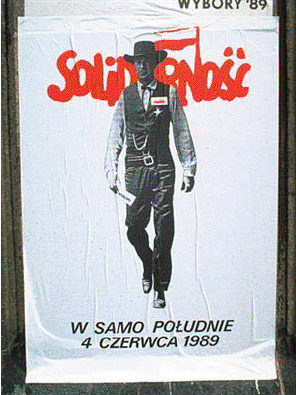 In the Solidarity (SOLIDARNOSC) poster, Sarnecki portrays Cooper armed with a folded ballot for Poland's Solidarity Party in his right hand & wearing the Solidarity (SOLIDARNOSC) logo above his sheriff's badge in a showdown with Communist 'bandits'. 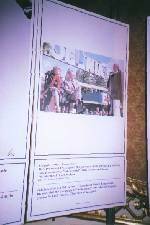 The message at the bottom is short and to the point: "W SAMO POLUDNIE 4 CZERWCA 1989" - It's High Noon, June 4, 1989. This special edition poster (27 1/2"w x 39 1/2"h) was printed in 1999 in Poland in a limited quantity by the artist in honor of the 20th Anniversary of Solidarity - 1980-2000. Today, the 1989 poster is almost impossible to find since the few which have survived are incredibly valuable - artistically, historically as well as monetarily. 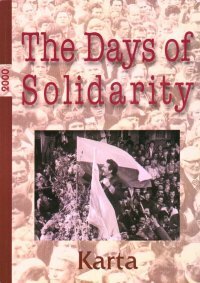 book "The Days of Solidarity"
The events which took place in Poland in August 1980 were a turning point in the history of post-war Europe. 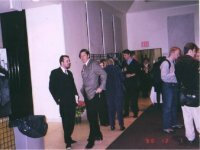 The breach in the previously united Soviet bloc which took place at that time marked the beginning of the end for the bloc. Those eighteen days of fateful August (14th to 31st) are like a time capsule. 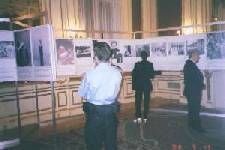 "Solidarnosc, Twenty Years of History"
Over 280 unique photographs documenting the history of NSZZ "SOLIDARNOSC." 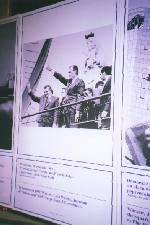 Moments of hope and glory, martial law and III Rzeczpospolita (Republic of Poland) caught by the most famous photographers and amateurs. 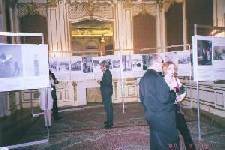 Pictures taken by demonstrators in secret and those kept in official communist archives. 250 pages.